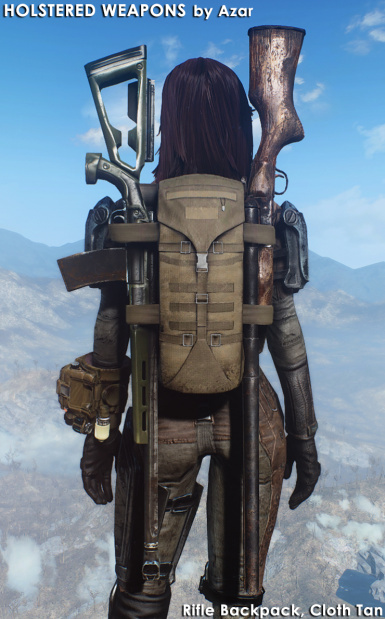 Holstered weapons for your Fallout 4 characters. Contact me if you want to use any part of my mod in your mods. 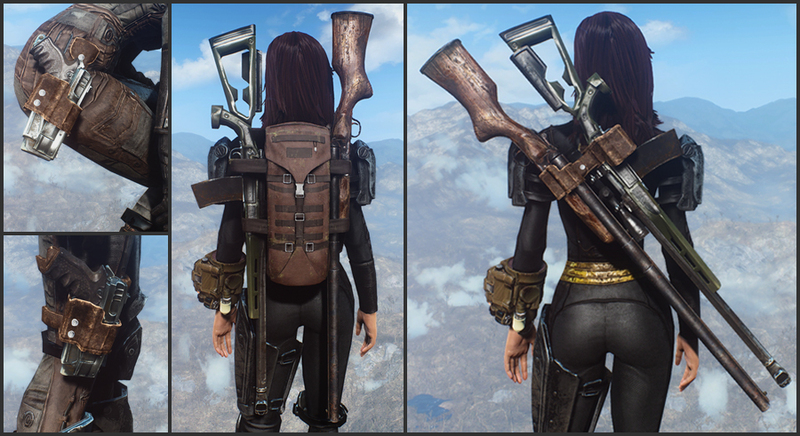 Backpack, 10 mm holster, rifle holster, and shotgun holster by Azar. Weapons by Bethesda Game Studios. 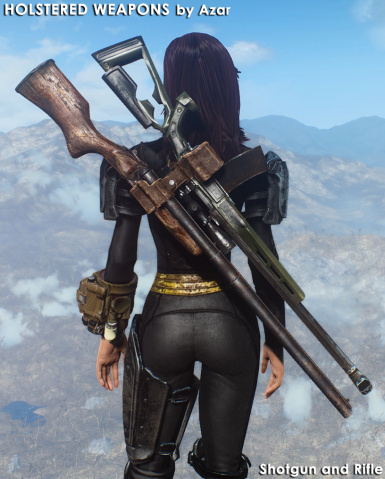 This mod adds holstered weapons for your Fallout 4 male and female characters. They can be created at a Chemistry Workstation, or bought from Malia, a new vendor who can be found on the main road to Concord. All the items provide a minor armor bonus. 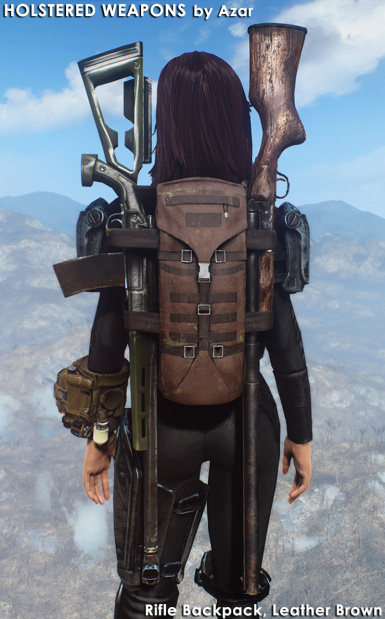 The backpacks give a +50 carry weight bonus. 1. Download the mod from the mod page. Select either the vanilla or the CBBE version. 2. 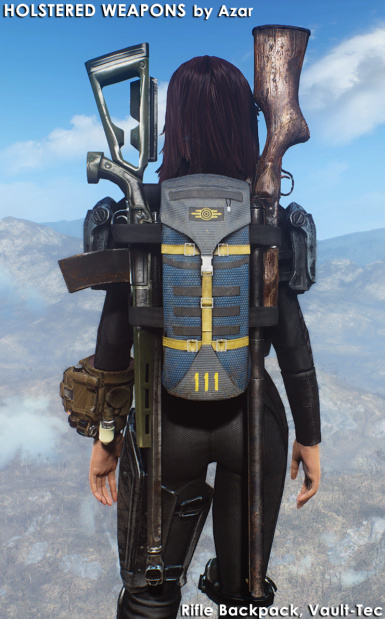 Install manually (unpack the zip contents into your "Fallout 4/Data" directory) or with Nexus Mod Manager. 3. 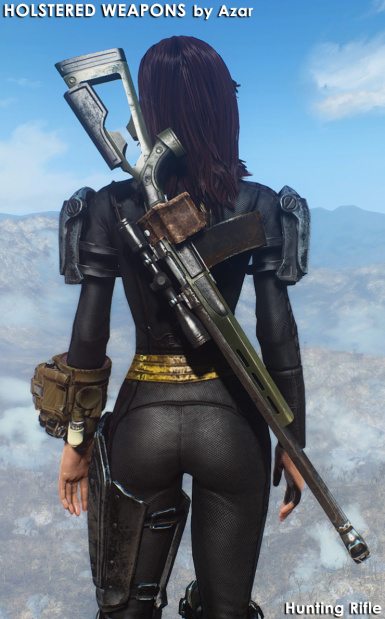 For the CBBE version, open Bodyslide, select "Azar Holstered 10 mm Hip" in Outfit/Body, your preset, and build. 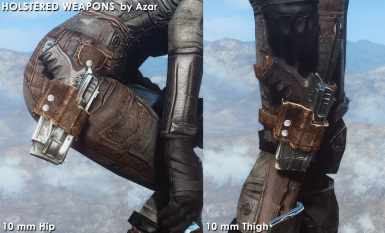 Do the same for "Azar Holstered 10 mm Thigh". 5. 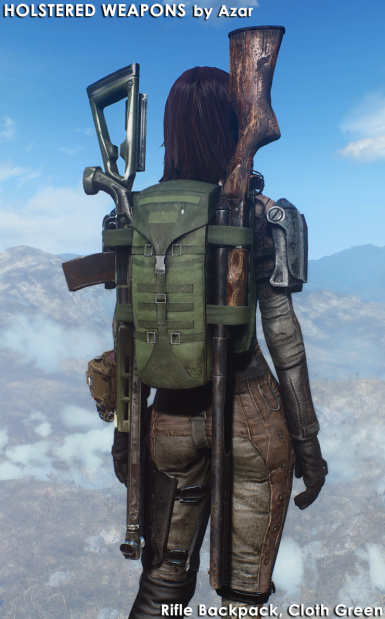 Craft the items with a Chemistry Workstation, under the "Azar's Holstered Weapons" and "Azar's Holstered Weapons, Backpack" categories. 6. 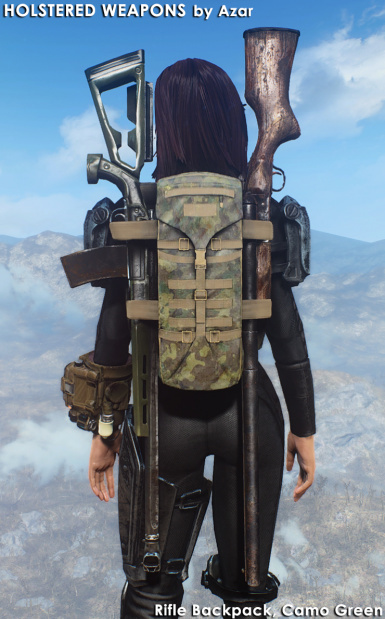 The modular backpack consists of a base piece (i.e. "Azar Backpack, Camo Black, Base"), a left attachment (i.e. 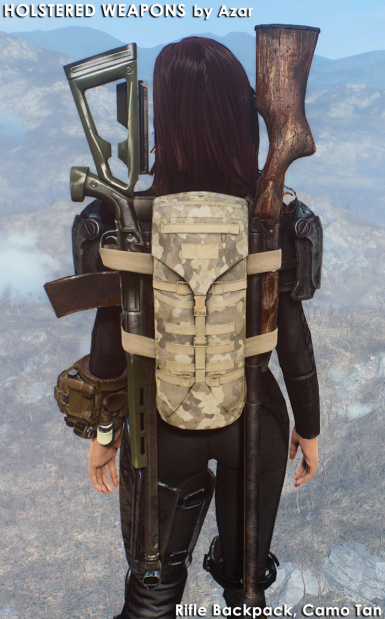 "Azar Backpack, Camo Black, L Combat Rifle"), and a right attachment (i.e. 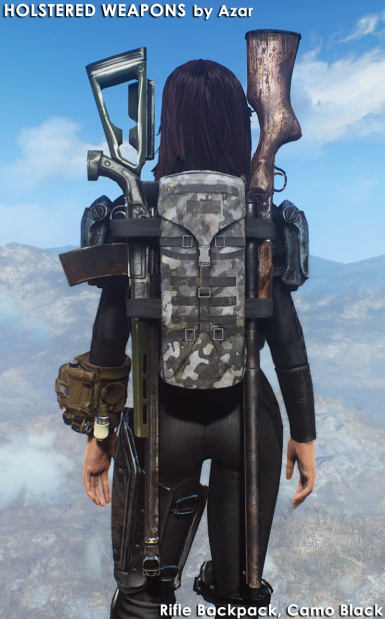 "Azar Backpack, Camo Black, R Laser Rifle"). 7. You can also buy the items from the vendor Malia. She can be found on the main road to Concord, in front of the yellow house. 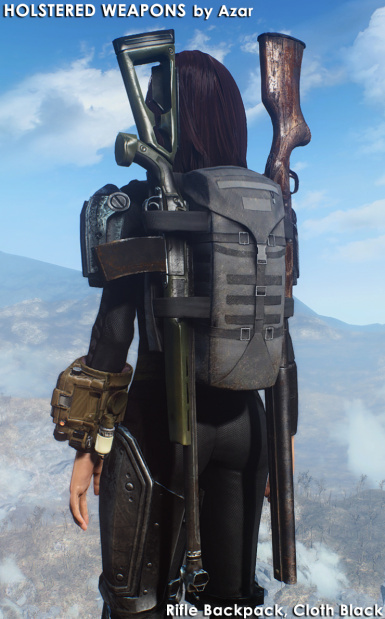 - Added a modular backpack with 7 different weapons. - Removed straps from 10 mm thigh and adjusted position on the leg. 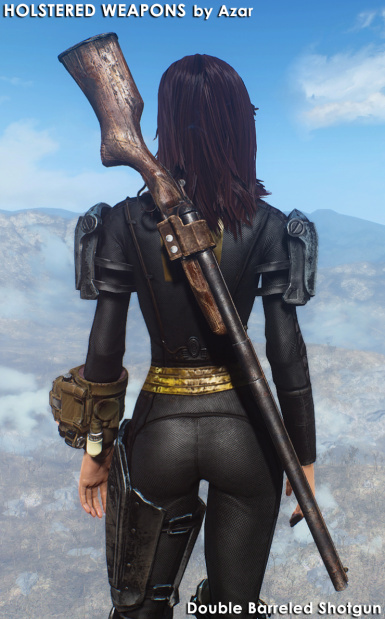 - Added Malia, a new vendor who sells Azar's Holstered Weapons. 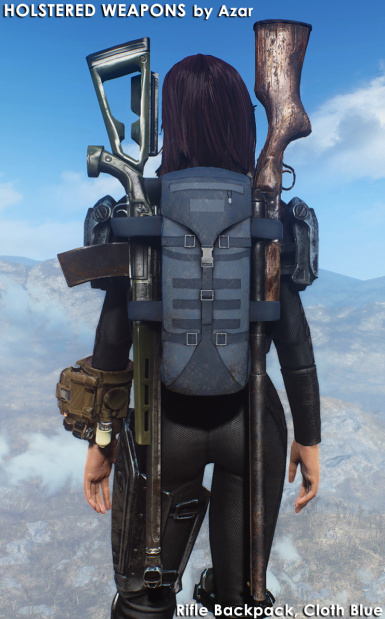 - Weight bonus for the backpacks changed to +50. - Initial release, 14 items.